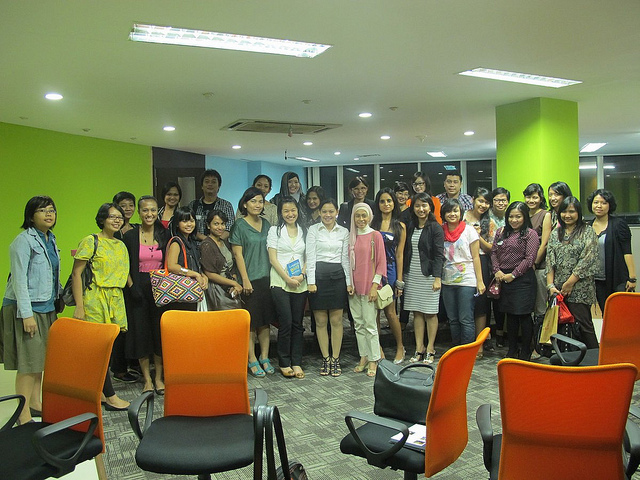 Girls in Tech Indonesia: Do Indonesian Women Matter? There was an intriguing question from Sati, Managing Director of Endeavor Indonesia, at last night’s Girls in Tech Indonesia meetup. She asked:“Do Indonesian Women Matter?” – The answer is a big fat YES. April is a ‘woman’s month’ in Indonesian calendar, because April 21st is the day we celebrate Kartini day. Kartini is a daughter of Mayor of Jepara back then who believe in woman’s equal right for education. She wrote a lot of letters for her Dutch pen friends, explaining about her insights & vision for women in Indonesia. You can read the collection of her letters in Project Gutenberg > Letters of a Javanese Princess. Thank you Project Eden for hosting the event! Thank you my partners @anantya@adheRiyaalso @GirlsintechIDassociate @Fikhanza– team from Think.Web and Think.Voice who’ve been helping us with the event. Sati elaborate the answer on why Indonesian women matter. Women number is 51% of 240 million Indonesia population. We’re bigger in number, living in a country with 1 trillion dollars GDP, biggest economy as well as country size in SouthEast Asia. Growing 6.5 – 7%. Relatively stable, politically. And more than 60% are below the age of 39 years old. That is A LOT of energy that will provide a dynamic and creative workforce. In few years, we will have the world! If women can initiate their way to entrepreneurship (unleash their potential and absorbs workforce) and learning how to give better nutrition and educate their children better as Indonesian next leaders. So, (Indonesian) girls, are you ready for the challenge?